Find your state graphic in black and white or click HERE for these in color and other state-based and general shareable graphics and sample tweets. *Equal Pay figures for this community vary widely by ethnicity. On Tuesday, April 4 – Equal Pay Day, 2017 – women’s, labor, and civil rights advocates will participate in an #EqualPayDay Twitter Storm at 2:00 – 3:00 pm ET to mark the day when the average woman’s pay finally catches up to the average man’s pay from last year. 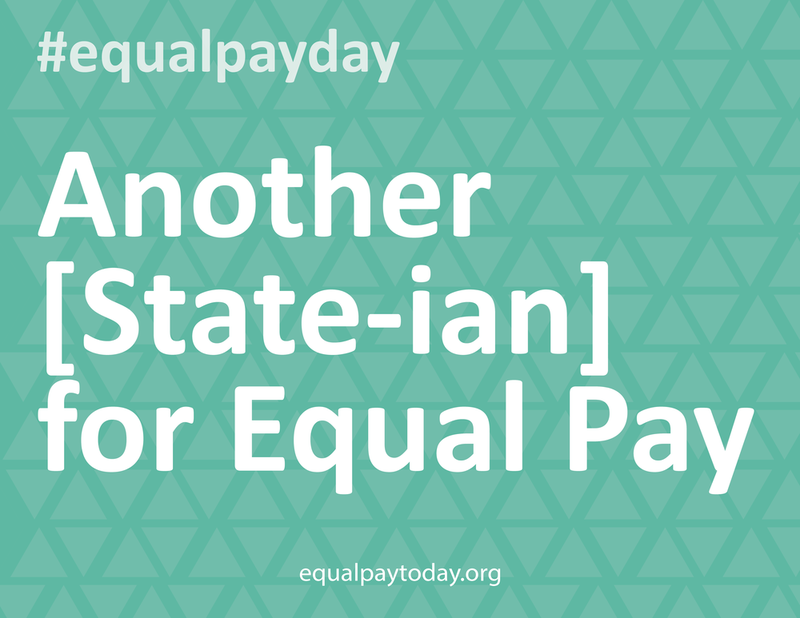 Download a photo of yourself holding a state-specific sign -- “Another [INSERT State]ian for Equal Pay” -- and share it on social media using #EqualPayDay and including the twitter handle of your local, federal, and/or state lawmaker. State-specific graphics and sample tweets, as well as background materials and other shareable graphics from coalition partners, can be found at HERE or by following #EqualPayDay. We have included a few Equal Pay Today! produced graphics below. Thanks to Spitfire Strategies for these graphics!